NOTE: This post discusses a movie that is not yet available in wide release. I have not had the opportunity to see it, though I have done significant research on its content. 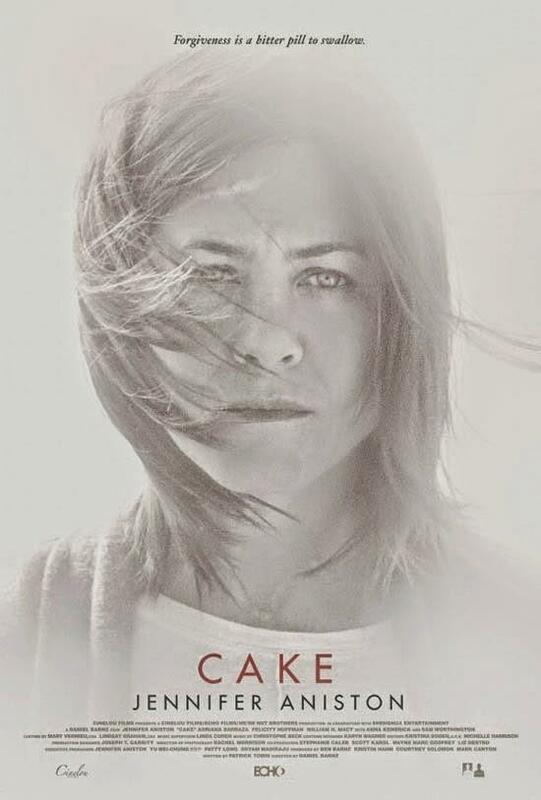 Jennifer Aniston is racking up praise, and awards nominations, for her role in “Cake“. In the new movie, Aniston plays Claire Simmons, a chronic pain sufferer. That part of her character excites me, as it sheds light on the challenges of managing everyday life with unending pain. Unless you live with it, it’s impossible to imagine how pain touches every moment of every day, and this part of the movie will be eye-opening for many. Watching the trailer and seeing her character struggle, I keep thinking “I’ve been there”. However, Claire is also addicted to the prescription narcotics she uses to manage her pain. By all accounts, her performance is admirable. Still, as a daily Percocet user, I cringe at the thought of once again being represented in the media as a drug addict. Before I go further, let me state very clearly that I understand the perils of drug addiction. According to recent studies, more than 2 million Americans are addicted to prescription opioid painkillers, and the number of deaths from these drugs has quadrupled over the past 15 years. It is a serious issue, and one that deserves attention. The problem is complex, and overprescribing is one of the causes. If you need help, I urge you to seek it here. Please. Media is all over this epidemic, and “Cake” is just the most recent example. A running theme in “House” is the main character’s struggle with chronic pain and Vicodin addiction. Disclaimer: Aside from the pain = opioids = addiction story line, it’s one of my all-time favorite television shows. And the emphasis extends well beyond fiction. “The Doctors” are already using “Cake” to discuss the problem of painkiller addiction in America. In testing for abuse and addiction, the studies included 2507 chronic pain patients on opioid therapy. 3.27% developed abuse/addiction. When the group was controlled to include only those patients with no history of abuse or addiction, the percentage dropped to 0.19%. In testing for aberrant drug-related behaviors (ADRBs), 2466 chronic pain patients on opioid therapy were included. 11.5% showed ADRBs. When the group was controlled as above, including only those patients with no history of these behaviors, the percentage dropped to 0.59%. This series of studies all conclude the same thing: chronic pain patients using opioid therapy overwhelmingly do not abuse these drugs. There are exceptions, but we are not a primary source of the nation’s problem. However, when the media tackles the issue of prescription drug abuse, it tends to focus squarely on the chronic pain population. This association has real impact, on policy and perception. For the truth, I encourage you to listen to the millions of spoonies. We use opioids as directed. They don’t get us “high”. With them, our pain is dulled, and most days, we can function. We can work. We can take care of our kids. Suffer every day with unbearable pain because our doctors, fearful of DEA prosecution, won’t prescribe opioids that could help us. Drive each month to the doctor’s office each month to show our license and sign for our opioid prescription. Face scrutiny from doctors and pharmacists when we ask questions about our dosage. Must legally document the pharmacy we’ll use to fill the prescription, limiting our options to fill the prescription. Must drive to the pharmacy to learn whether they have stock. The information cannot be provided over the phone. Drive to multiple pharmacies to find stock. My record is 8 CVS visits within a 40 mile radius, in one day, to fill one prescription. It took 7 hours, and I was in tears from the pain of driving. Endure judgmental looks and comments from pharmacists, doctors, nurses, family, and friends. Without opioid therapy, I would not be able to work, cook dinner for my family, or ironically, make my numerous doctor and pharmacy visits. We need understanding, genuine help, and sensible laws, not blame and judgment. Come to think of it, the same is true for those that are addicted. But that’s a post for another day. Perception needs to change, and the media wields great power to help. Their portrayals of chronic pain patients, however, often do the opposite. This movie is just the latest example. Though I will check it out when it’s released, I have very mixed feelings on “Cake”. And that’s not something you usually hear from me. I’m lucky that most of the time OTC pain killers work for me and I can save the stronger stuff for my RA flares. My brother, however, has severe, chronic osteoarthritis in his back and hips and is generally confined to the bed or a wheelchair. He simply cannot live without strong pain relievers. As a veteran, he receives his drugs from the VA mail order pharmacy and is dependent upon them to ship his pain killers in a timely manner. Most recently they were almost a week late getting to him. I can’t imagine the agony he was in waiting patiently each day for the mail to arrive, hoping he could get some relief. I agree that abuse (of anything) is an issue. But denying or otherwise restricting pain relief from patients who badly need it is both cruel and inhuman. That’s why the drugs were invented. Let those of use who use them wisely and honestly need them have the access we need. Thanks so much for reading, Carla, and for sharing your story. I agree with you 100%, and I wish many pain-free (or at least pain-tolerable) days to you and your brother. Have a great day! Great article! I think that many of us can take pain meds, as directed, because we don’t have the propensity to abuse. However, there are addicts who also live with chronic pain. I’m not sure how they manage, as the medication can become a drug. Hopefully the movie shows other chronic pain sufferers who do not become addicted to their pain meds. I was on heavy duty pain meds for a few years, until I decided to wean off. I wasn’t abusive with them, but there is serious addiction in my family. But, it is very frustrating that opiates are becoming harder to obtain for those of us with chronic pain because others abuse them. I suppose this will forever be an issue, until they find a cure! Lady Nicole, I think you’re absolutely right! Ultimately, we need a more nuanced approach to regulation with these drugs, and more sensitivity to the real, physical struggle of addiction. They are mostly separate struggles, but it feels like the media tends to treat most/all chronic pain sufferers as addicts. Thanks so much for reading, and for sharing your thoughts! Netflix suggested that title to me so I’ll have to give it a watch. Love your blog. I have RA as well and Fibromyalgia. My pain situation has been complicated though as I DID develop a raging addiction to the only meds that actually helped. So now I get a small modicum of relief from SUboxone and some other non narcotic meds, but it’s a huge struggle. I am pursuing wls so I can drop some weight and get my knees replaced as my mobility is all but gone. And right back at you! I am slowly but surely making progress towards my goals.